Last week went pretty well. 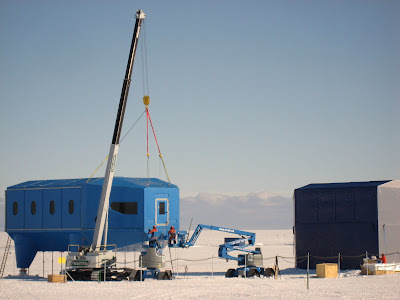 The final module received its outer cladding, including the delicate nose-cone in excellent weather. Standing close up, it looks mighty impressive. Not so much a base, more an alien landing craft - a cross between something from Starwars and Red Dwarf's StarBug. Pretty futuristic, for sure. I spent most of the week preparing for Saturday's entertainment - Folk Night. Not just music, but poems, acts and film, it was to be a night for everyone from everyone. A venue was booked, then changed as temperatures dropped and a small space would be easier to heat. Acts singed up and practiced in secret (an achievement in itself at Halley). 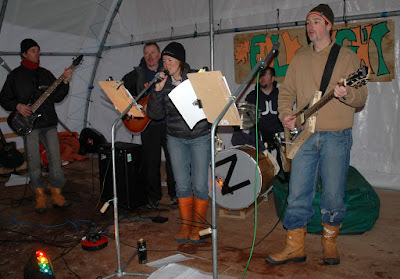 Taking the description "Folk Night" literally, the band found a mandalin and started practicing some trad songs, when Kirk explain that "Folk Night" is infact a Rothera-ism for variety show, and any music was welcome. 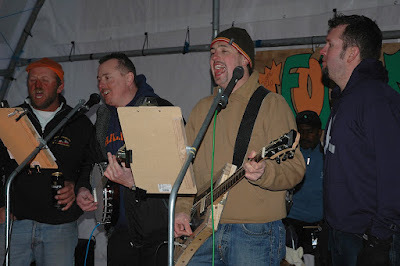 That clearer up, we put away the fiddle, shaved off our beards and went back to what we do best - soft rock. 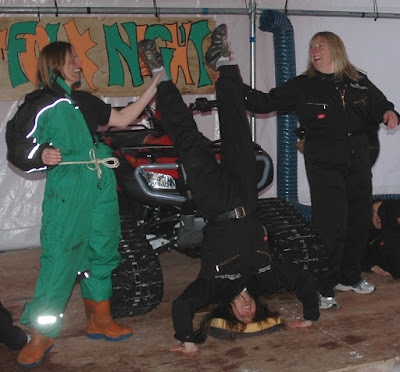 Following the well-proven formula of big tent, big sound system and bigger pile of beer, a small gang of volunteers attacked the skidoo tent and produced the venue. The tent already had a stage, so we added some wings, lighting, a bar and tables in the form of empty fuel drums. Heading back in for a bite to eat, it looked good. The acts were plentiful and hilarious. They included a team of construction workers singing "Welcome to Hotel Halley 6 Site"; a "Bloopers" film by Kirk; Various bawdy acts and songs; Poetry readings; a couple of accoustic songs by Mat; a play staring Dave S, twice, using the video screen; and finally, the girls with a superb spoof of Grease, with a wild dance routine and a pimped up quad-bike. The evening concluded with our new band, Toucan Rool and the TickSheets coming back on with some boot shaking country numbers, complete with special guests on the mic and drums. (L to R) Andy, Mark, Vicky, Dean, Me! After playing for about an hour, my fingers and throat were raw. Mark and Andy still had more to give and were joined by keen singers to blasted out a few last numbers while I sat back and soaked up the atmosphere. It was a top night, enjoyed by all, especially the contributors. Definately one of the highlights of the season. Sunday dawned cleared headed thanks to construction types hoarding all the beer and refusing to share, so I joined Jules and Simon with my kite to crank out some Charity laps. There wasn't quite enough wind for my snowboard, but on skis I was flying. Kite-powered and leg powered skiers raced like hare and tortoise - the kiter speeding away down-wind, but then having to make slow tacks to get back up for the return leg. On the slick groomed snow, 3.5 laps came up easily before my fingers froze and it was time to go in. In total, we managed 218 laps - a massive achievement with some incredable personal bests. Andy RAN 18laps. A mighty 90km. On snow. Wow! There's only a week to go, and I'm glad to be leaving. Winter was great, but I would be lying if I said the summer has been an entirely happy time. Psycologists will be dissapointed to learn that those of us who wintered together are not, in fact, at each other's throats. We've had a great time and still get on fine. However, the personality tests for contract workers don't seem so tight. There are some great individuals on the crew, but as a group they are spoiled by the selfish actions of some. Communal living requires consideration and empathy. Things like not one of them helping clear up after Saturday night; cigarette butts on the floor; using the new cordless phone at the urinal (yes, really), and generally being all take and no give; all add up and have made a number of us seeth. But that's just part of coming back to reality, I suppose. Hopefully when the blizzard dies I'll get some more great kiting and skiing with my mates, so I can leave with fresh memories of why this has been, in the vast majority, an amazing year. whats going on with your facial hair in this picture??? It's my ROCK DEAMON moustache. It looks rubbish, so it's gone now. I hoped after a year here my beard growing would be better than this!